Belvedere Polish Plain Rye Vodka is a popular Vodka available from DrinkSupermarket.com in 3lt to buy online. 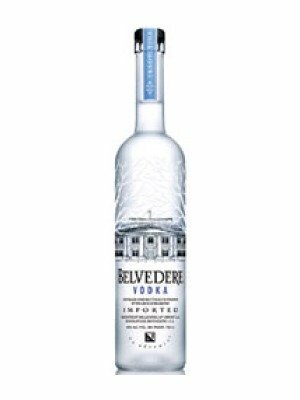 Visit DrinkSupermarket.com for the best price for 3lt of Belvedere Polish Plain Rye Vodka or compare prices on our other Vodka products. Discover why Belvedere is celebrated by discriminating enthusiasts worldwide. Belvedere's taste profile features a subtle sweetness and smooth, clean finish that only comes from using 100% Da^kowskie Gold Rye as the single-grain ingredient. Belvedere Vodka hails from the small town of Zyrardow in the Mazovian plains west of Warsaw, Poland. Following traditions dating back over 600 years, Belvedere is handcrafted in small batches to ensure superior quality meeting only the highest of standards. Belvedere is distilled four times, the optimum number for enhancing its unique, subtle character. If a taste sampling shows even a hint of imbalance, the entire batch is destroyed. First introduced to North America in 1996, Belvedere single-handedly created the luxury vodka segment (now the fastest-growing category in distilled spirits). Seven years later, Belvedere's high character and uncompromising integrity are recognized internationally. Consumer demand continues to increase at an accelerated pace, and worldwide recognition of the brand is at an all-time high. As Poland is widely recognized as the birthplace of vodka, it is fitting that Belvedere is named after the Belvedere Palace, formerly home to Polish royalty and presidents. Today, Belvedere Vodka offers a luxury experience to a broad international audience of vodka enthusiasts and connoisseurs. Where to buy Belvedere Polish Plain Rye Vodka ? Belvedere Polish Plain Rye Vodka Supermarkets & Stockists. You can buy Belvedere Polish Plain Rye Vodka online in most retailers and find it in the Vodka aisle in supermarkets but we found the best deals online for Belvedere Polish Plain Rye Vodka in DrinkSupermarket.com, TheDrinkShop, and others. Compare the current price of Belvedere Polish Plain Rye Vodka in 3lt size in the table of offers below. Simply click on the button to order Belvedere Polish Plain Rye Vodka online now.